Clara Barton was a Civil War nurse aiding wounded Union soldiers. Who was Clara Barton. Most folks grew up with the name Clara Barton.. as they remember her name from casual conversations..usually about her nursing abilities.. and the American Civil War. Clarissa Harlowe (Clara) Barton was born on Christmas Day, 1821 in Oxford, Massachusetts. During the next 90 years of her life, she would be a teacher, a patent clerk, a nurse, and early developer of what would later become the American Red Cross. What we remember about Clara Barton is her great humanitarian efforts attempting to relieve the suffering of thousands of wounded Union soldiers during the carnage of our Civil War. Her efforts will prove to save so many young lives. Her start in battlefield nursing will be official, hard, and fast in August of 1862 during the “Second Battle of Bull Run” after she is finally given permission to go to the front lines with wagon loads of medical supplies she has been obtaining through Northern Christian Aid Societies. Keep in mind the army did not have an efficient system of caring for the wounded..or the dead in fact. Wounded are simply removed from the field of battle..aid is slow or does not come at all. Wounded men would often languish for days on the batttlefield..in heat or cold. Only the efforts of brave humantarian soldiers “who had winessed enough” would be available to the wounded..as in the case of “The Angel of Maryes Heights” at Fredericksburg.Thousands will continue to die from shock, blood loss and dehydration. Clara has witnessed this up close and in her proactive way has come forward to help fill the void by simply showing up with medical supplies that the army surgeons are more than thankful..and surprised to receive. Arriving at the “Battle of Antietam” later in September, 1862..she will again arrive with supplies when the surgeons are completely exhausted..both in body and supplies. She will arrive with clean bandages when men were using corn husks to tie off wounds. Clara even thought to bring boxes of candles so the surgeons could do their grisly work throughout the night as she earns the respected title “battlefield nurse”.. working side by side with the surgeons as they deal with the most horrific of wounds..under the worst conditions. Courage, commitment, love. 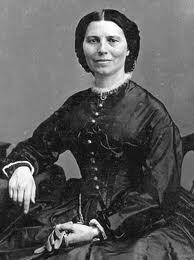 Clara Barton will continue her battlefield nursing efforts throughout the Civil War..earning the nickname “Angel of the Battlefield”. Clara will work for the war department after the Civil War in 1865..giving lectures and interviews regarding her war time experiences..and her political fight to increase the immediate aid to wounded soldiers. Her later visits to Euope in 1870-1871 during the Franco-Prussian War will bring her in contact with the International Red Cross. On her return to the states..she will lobby in Washington where she has become quite active..for an American branch of the Red Cross. The American Red Cross Society will finally be founded in 1881..due to the selfless efforts of this brave and caring woman. Clara will become the first president of the new American Red Cross managing the Red Cross efforts during domestic US tragedies..such as the Johnstown Flood of 1889..and the great Galveston Flood of 1900. Clara Barton will resign from the American Red Cross in 1904 after much internal struggle and investigations regarding mismanagement financially, although it was knowledge that Clara Barton received no salary from the Red Cross. Clara Barton will write a book entitled “The Story of my Childhood”, published in 1907 while continuing her humanitarian work and giving countless lectures. Clarissa Harlowe “Clara” Barton.. the great humanitarian leader, battlefield nurse, founder of the American Red Cross will pass away at her home at Glen Echo, Maryland on April 12, 1912. Our continued thanks for your caring and love..Clara Barton. Read and understand the trying journey of this selfless woman. One of histories greatest humanitarians.. at a time when her call to duty was needed so dearly during the bloody battles of the Civil War. Clara Barton will travel to numerous battlefields..actually driving her wagon hard to the sound of the guns, to aid the broken men lying wounded as they lay on the ground by the hundreds..untreated. She will continue her battlefield work..and later pioneer the founding of the American Red Cross.